Yep, I’m in big trouble for that. How much trouble? Oh dear. I made fun of people with faith in God? Of the hundreds of pastors who get True, you know how many complained? Right: none. But I don’t keep him in the basement. She’s Serious. And She Thinks She’s Lucid. Uh huh. That clears that up. If you wonder why I keep calling this raver “Santa” it’s because that’s her screen name. When I asked her why she hides behind a screen name and won’t sign her name to her opinions, as I do, she refused to answer, but did tell Rus she’s a woman. Of course, I’m sure it’s just some sort of cosmic coincidence that “Santa” is an anagram of “Satan”. The funny part of this is the timing: Rus happened to be at my house when this unfolded, because he is indeed in seminary (he already has a Masters in Divinity degree from Asbury Theological Seminary in Wilmore, Kentucky) — his congregation thinks so much of him, they are paying for him to attend the Wagner Leadership Institute in Colorado Springs to get his Doctorate in Ministry. When he’s here, Rus and I often talk about how some people hide behind selected Biblical passages to condemn, yell, scream, curse, and damn others to hell — thereby driving millions of people away from churches — rather than treat others with the respect that the Bible demands. I can smile at the foibles of politicians, criminals, school officials, landlords, cops, military officers, students, bus drivers, athletes, farmers, animals, royalty, conservatives, liberals, and everyone else but Christians, because if I dare suggest that they are human too, a few crybabies will stamp their feet and shake their Bibles at me, sputtering with quivering, anonymous voices that I’m going to hell. What a sad example of Christianity indeed. Santa is of course right about one thing: a lot of my readers do believe in God. Luckily, most use their beliefs to enhance their own lives, rather than use them as a weapon to try to condemn or control others. Feng shui is not “God”, nor is it a religion (and no one — except maybe “Santa” — ever argued it was); it’s an ancient practice of assuring that the “energy” in spaces flows harmoniously through the environment. It is sad indeed to see that some Christians cannot stand the concept of harmony. Luckily, most people who believe in God also believe that He has a sense of humor, and know their personal beliefs are not the only way to think. I generally love the entire “This Is True” mailing. However, I was disappointed to see you take a cheap shot at people of faith this week. A frequent accusation against christians in chat is that we try to impose our faith on others. Some believe this so deeply that they fear a theocracy in the US if candidates supported by some groups are elected. (In fact, most of the noise comes from cults that take the forms but not the substance of christianity, but that’s difficult for outsiders to see.) In the case you cited, the individuals are dealing not just with words, but with having the actual forms of another faith imposed on their work place. Why is their reaction worthy of scorn? But even so, I didn’t heap “scorn” on them, I rolled my eyes over them. Why could you not smile with me, and simply move on to the next story? Comments are open below if you want to add your two cents. I’m not terribly concerned about going to hell — not with this up my sleeve! Quite simply, I decided if “Santa” had the power to condemn me to hell with the snap of her mind, I should have the power to counteract her evil. Oh how I love your e-mail, it always brings a side-splitting chuckle to my life! If not from the excellent columns, then from the response from the weirdos. What is it about some people that causes them to judge something entirely by fear that they are being poked fun at? Why can they not laugh at themselves? Why are they so thin-skinned that people can see them for only one thing — whiners? Oh well, can’t please everyone, and I hope you never try to. I’ve wandered to and from Christianity throughout my life… the from because of closeminded thinking and selective scripture-thumping, the to for the message of all accepting love and forgiveness of *everyone*. I don’t know if ‘Christians’ such as Santa are the majority or not, but I certainly know plenty of Christians who are embarrassed (myself included!) by her lot. We have danger of losing our hold on reality if we take anything, including religion, too seriously. Please, keep up your fabulous work, and keep me laughing (and crying sometimes, with HeroicStories) every week. I am a born-again Christian, I attend church, and I try to live by the tenets of a moral life as God defined for me in the Bible. I wanted to stand up for the majority of Christians who *do* have a sense of humor and *won’t* condemn people to hell because they disagree with them, or because another person is “living in sin”. Jesus came to save, not to condemn. Although I can’t save, I can lead people to the Savior if they want. But I would never condemn. I’ve talked to people here and there (the fringe types) who have told me they’re surprised by my “liberal” reaction to their lifestyles. They know I don’t agree with certain moral or lifestyle choices they’ve made, but they seem surprised that I would even be near them, let alone not beat them to death with a Bible. Thank you for keeping your conversation with this woman in an arena of logic and wit. Obviously, she is only able to live in the arena of condemnation, anger, frustration, and knee-jerk reactionism. I’m sorry for her and I pray God will change her attitude. Because she does present a terrible image of a Christian. People of faith need a sense of humor too. Being a person of faith AND possessing a sense of humor is not mutually exclusive. I happen to think your “Peeved” and your “sun” commentaries were hilarious. I happen to be a member of the largest order in the Roman Catholic faith (The Franciscans). I say don’t let it get to you. Illigitmi non carborundum! (Don’t let the bastards wear you down.) I have no doubt in my mind that Christ would have, and probably, did laugh at a LOT of things. St. Francis of Assisi was documented as having been quite joyful and having a sense of humor. Long time fan, constantly provoked to both laughter and thought by your column; long-time Christian. I struggle with “Christians” who make the mistake of judging people by the standards we have chosen, when it is far better just to love them – didn’t Jesus say “Love one another, as I have loved you. By this will all men know that you are my disciples – if you have love for one another.” I’m sorry – where does it say “if you judge others by a standard they haven’t chosen”? Keep up the thought-provoking, laughter-cramp-inducing commentary, Randy! I love this! Keep it up Randy! I myself am a “recovering catholic” and have a serious problem with certain flavors of organized religion. The worst being those that preach the “you’re going to hell, cuz you don’t believe what I do”. They also seem to forget (if approved by the religion of your choice) that humor is a good thing. BTW My [Insert deity of your choice] says believe in a higher power and be nice to everyone! So I will be ordering a big pack of GOOHF cards to counter act the replies of people sending me to hell for writing this. I think another corollary for Godwin’s Law has just arisen. Any discussion in any forum that invokes a “You’re going to hell for that…” ends the discussion and admits failure. It could be the failure of logic or of compassion, but it instantly brands the condemner as a knee-jerk idiot, whatever his or her faith. It also undermines any intelligent thing they may have said up to that point, in the minds of most readers. It has gotten so bad that it’s difficult to admit to Christianity as one’s belief, because so many people will immediately brand one as “one of THOSE” and ignore one thereafter. BTW, I’m a Christian myself. And if you’re going to hell, it’s not “for that”. According to the Bible, hell is the default destination, not the optional one. Regrettably, I have lost more than one relationship on this point, having been at one point or another both the recipient and the idiot. Further to my own comment of Aug. 29, I hereby lay claim to this adjunct to Godwin’s Law, heretofore to be known as “Klaver’s Law” (subject to someone pointing out I wasn’t the first to outline it, of course). It states that “In any discussion, the person who condemns another with ‘You’re going to hell for that…’, has branded themselves as a knee-jerk reactionary idiot, guaranteed that their comments will be ignored by all, and permanently destroyed any relationship they may have previously had with the target.” It concedes one’s failure to rationally argue the point any further, and is interpreted by most readers/listeners that the condemner has lost the argument. In many venues, it also ends the discussion. I’m reminded of a favorite Gandhi quote of mine: “I like your Christ. I do not like your Christians. They are so unlike your Christ.” As a Christian (albeit a fairly liberal one), it always saddens me when people spread so much hate, supposedly in the name of Jesus (who I can’t claim to speak for, but likely wouldn’t have been offended at your column). I was brought up in church, was the church pianist, and sang in a fairly popular gospel group throughout my childhood. I believe that God not only has a sense of humor, but I believe that the God I serve is not offended if I ask questions about the Bible’s teachings. I can’t believe in something that I don’t understand, so I want to be able to ask, if something doesn’t make sense to me. I believe the same about people. If you are above reproach, are telling the truth, etc. why should you be offended if someone questions you? That is a perfect opportunity to clear up doubts in someone’s mind. God has nothing to hide, and I am happy that I serve a God that I can talk with honestly. I was mad at God when I found my 17 year old dead in his bed. It was very therapeutic to be able to talk to God about my anger towards Him. Over time, it helped to improve my relationship with God. I was fortunate enough to learn this from a devout christian lady who told me, “If you are angry with God, talk to Him about it. He can take it. We serve a big God”. I knew that God had a sense of humor when I awoke on April Fools Day in Alabama, to find 6 inches of snow on the ground, and no one predicted it! God has also found many ways to give me comfort concerning my son’s death…On Mother’s Day, a stranger gave me a dog that looked like one my son and I had wanted, and the dog had my son’s birthday. I was grieving and had asked God to show me a sign that my son was safe in Heaven with Him.One of many miracles that God used to help me get through my grief. I’ve been a faithful reader for many years, but read this entire story today for the first time. Many thoughts come to mind that I would like to share, but mainly I want to say that DeDe has summed up my own life experience: I was angry at God and told Him so… and He didn’t push the button and strike me dead; He actually used that time to grow me into a better person. For the record, anyone who purports to condemn you to hell is usurping the God in whose name they condemn you, which is one of the things the Bible says should be punished by death. I would never dream of accusing anyone of being worthy of death or hell, but I can tell you I laugh often at your stories of people who don’t understand their own religion. Keep up the great work, and keep me thinking. Thank you Randy for republishing this. My wife passed away 4/28/13 and I have been sad and pretty angry since. I gain solace in the knowledge that after twenty-one years she is no longer in pain. This reminds me of an experience when television was new. I had to move a new color television. Doing so changed the color significantly and caused wavy lines in the picture. Moving the TV back fixed the problem. In troubleshooting, we found that the person had a speaker next to the new location that had a very powerful magnet in it. Moved the speaker, tweeked the color. It was fine. I would like to ask “Santa” because I believe in Magnetism and can prove that it exists. When I determine an electrical problem and look first for a magnetic reason, am I going to Hell? No one can certainly argue that magnetism is a god. There are forces like magnetism and gravity whose influences can be shown but belief in them does not diminish my faith. When I die, I will request an audience with God and personally ask what lesson were my wife and I were to learn from this experience. I know (S)He will have a reasonable logical answer. BTW: If it is because I willed it, I will go to Hell. 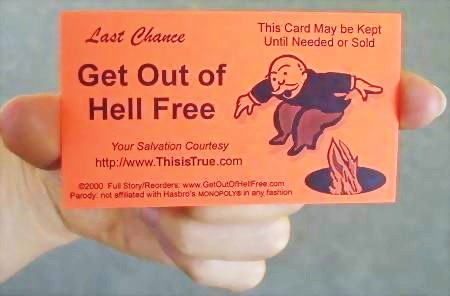 Maybe I will need every Get Out of Hell Free card that I own. Whenever people go gaga over some real or imagined horror they are forced to suffer due to their faith, I have to point out that they sound like the Pharisees that condemned Jesus for eating and drinking wine with tax collectors. They seem to forget those things. The first person he actually told of his mission was a Samaritan woman. A Samaritan. And a woman to boot. Jesus was the first liberal ever. The status of women and children and the redemption available to all, even tax collectors, was a new idea 2,000 years ago. But Santa can find the story in her own Bible. You’re still going to Hell but I am glad to have someone to talk to. See ya there Bud and don’t take crap from people who practice their religion to get others to PRACTICE. Ya gotta watch out for the ones who are actively recruiting. Thanks for sharing this story again for the benefit of those of us who haven’t been with you all this time. I actually knew a girl named Santa in high school (coincidentally, in Rochester NY! ), so there is a small but finite chance that it wasn’t just a screen name after all. One of my sustaining beliefs is that no Supreme Being could have created this loopy universe without having an active and well-developed sense of humor! I can feel God’s smile every time I laugh at His creations. Interesting to see comments on this article start showing up in my inbox again. Unfortunately, ‘Klaver’s Law’ (posted here in 2009 as “In any discussion, the person who condemns another with ‘You’re going to hell for that…’, has branded themselves as a knee-jerk reactionary idiot, guaranteed that their comments will be ignored by all, and permanently destroyed any relationship they may have previously had with the target.”) appears to have failed to catch on. Too bad; it might have had a cautionary effect if it had become pervasive. OTOH, many things designed to help people get along better have historically been panned. Everything from the Bible itself, to Dale Carnegie’s seminal ‘How to Win Friends and Influence People’ gets ironically used instead to try to beat people into submission. Mind you, Dale’s work is clearly derivative; find an old enough copy (say, 30’s to 50’s) and you can even see the Biblical quotes he used to prove (or come up with) his points. Still, for someone to accuse that using his principles amounts to manipulating people is ridiculous; all he does is outline how to treat people with respect, in the interest of possibly receiving the same in return. Maybe the point is that truly closed minds can’t be influenced… at least by anything less powerful and personal than a miracle. If it IS possible to open the closed minds, I expect it’s a one-on-one long-term process, and who has the time and energy for those anymore? Still, I’m glad someone out there (that’s you, Randy) still tries. GL with that. Just a thought: Perhaps what we need today isn’t a platitude like Klaver’s Law, but more of a modern-day Aesop writing updated Fables. You may violate the principles of one of Aesop’s Fables, but nobody needs the moral of the story explained, and the parables themselves are colorful and memorable enough to stick with you. Instead of “The Boy Who Cried ‘Wolf'” (OK, not Aesop’s, but similar enough), maybe we need “The Man Who Ranted ‘You’re Going To Hell! '” to get the point across in a life-changing fashion. Of course religious people do silly things the same as atheists do, so why shouldn’t we get a laugh out of it? This is True doesn’t claim affiliation with any particular religion, and you’ve repeatedly demonstrated that you make fun of people from all walks of life without playing favourites. Taking steps to improve your life (or your crops) by manipulating a spiritual energy field really doesn’t match up with religions that don’t acknowledge the existence of such energy in the first place, especially not with religions like Christianity or Islam whose adherents are supposed to rely exclusively on God (or Allah, or…). I see no reason to get upset because you chose to write about the original story in the manner you did, but I also respect Martin Kelly’s decision to quit his job if that job required him to implement spiritual practices that don’t align with his own religion. If an employer tried to force employees to say Christian or Islamic prayers at work I suspect you’d be on the employees’ side, no? Why should employees forced to follow feng shui practices be treated differently? I respect Mr Kelly because he took a stand consistent with my understanding of his religion — that is to say he is not a hypocrite. I do not respect letter writers Sandra and Santa, both of whom took a stand that seems pretty inconsistent with their own religion. It seems like you may be making light of a woman named “Santa”. Let me assure you that, although not commonly a female name, it can indeed be a female name. I have a female client whose first name is “Santa” (yes, I had to verify it twice due to its uncommonness). I am not petitioning to deem her first name as Santa, nor to augment her opinions regarging your “holiness” or lack thereof, but regardless of her opinions, don’t regress into belittling her based on her given name: she can’t help that. Yes, I “know” God has a sense of humor. Some of the things that happen to me convince me that He sometimes screws with us just for fun. And I have no doubt that more than once, He’s fallen off of His throne laughing so hard at my expense. What makes you doubt her legal name? Granted, this is a long-ago debate, but only based on my own experience do I debate whether or not her given name is “Santa”, and that you may have “augmented” your rhetoric based on the opinion of her whether her given name is legit or not. When Googling “female name santa”, four out of the top five results yielded a reference to “Santa” being an Italian-origin female name. Much kudos to your long-term successful results with your GOOHF cards. Let’s see if you publish rebuttals to your posted rebuttals and opinions. Wouldn’t it have been easier, and more clearly journalistic, to reveal this omission earlier? Why oppress the name source information until now? Well, there is the sensationalism of using the anagram Santa/Satan. Randy, I admire and have followed you since long before there were Twitter and other means to do so. I rarely have any issues with your opinions, but for some reason, this one struck a note with me. I hope we can resolve this in an amicable way. My previous use of the word “earlier” doesn’t imply that you knew it from the beginning of your report, only that you knew it sometime between your first report and this, much later, re-listing. Seriously, I absolutely enjoy engaging with you about issues like this. I feel that we probably both do. I admire your gumption to publish alternative opinions. Thank you for that. And I apologize for my earlier second reply when I referenced “Let’s see if you publish rebuttals to your posted rebuttals and opinions.” I now see that was uncalled for, and aggressive. I love your work. Peace. First, men don’t know where hell IS. Second, men don’t know how to ask for directions anywhere.